Tall (1.93 m/6 ft 4 in), handsome (after some plastic surgery), stylish, rich, successful in business — John Zachary DeLorean seemed to have it all. He had risen to become Executive Vice-President of General Motors before resigning on 2 April 1973 under mysterious circumstances. 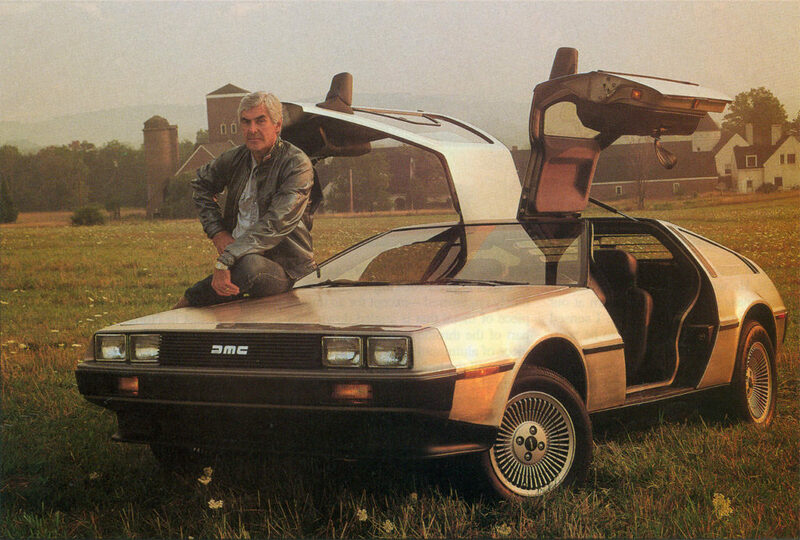 On 1 January 1974 he founded the John Z. DeLorean Corporation with offices at 100 West Long Lake, Detroit, Michigan. He hired himself out as a “consultant” to various companies, earning large sums of money for doing very little. On 24 October 1975 the DeLorean Motor Company (DMC) was formed and at the end of that year DeLorean announced his plan to build the ultimate dream car. DeLorean’s money men raised $6 million to finance a car. Not all the money was being spent on the car — DeLorean was paid a six-figure salary and he and his wife, Cristina Ferrare, lived in a luxury New York apartment. DeLorean was just about to sign a deal with the Puerto Rican government when he received a call from the British Government in the shape of the Northern Ireland Development Agency. The government was worried about the level of unemployment in the province — around 20 per cent —and was keen to encourage investment. The deal, worth £54 million, was signed on 3 August 1978. DeLorean hired Colin Chapman, the founder of Lotus Cars, to help with the design of the DeLorean-12. In autumn 1980 DeLorean went to see Humphrey Atkins, Secretary of State for Northern Ireland, and wangled another $33 million — DeLorean now had $120 million of British taxpayers’ money and the taxpayer had not one car to show for it. On 21 January 1981 the first DeLorean-12 moved off the production line, eight months late and $63 million over budget. To add to the difficulties, it was not a high-performance car and no one wanted to buy one. After questions were asked in the House of Commons, the government appointed Sir Kenneth Cork as a receiver for DMC. On 19 October 1982 the DMC factory in Belfast closed and the same day DeLorean was arrested and charged with conspiracy to buy and sell cocaine, DeLorean claimed that he had been entrapped by the FBI and, despite DeLorean being filmed in possession of a suitcase of cocaine, at 12.20pm on 16 August 1984 the jury found him not guilty.